Over the past few years content creators have produced a bonanza of quality content. Virtual MVPDs and other OTT and direct-to-consumer (DTC) storefronts have emerged to power untethered networks to offer this content to an increasingly tech savvy audience. From TVOD to SVOD, and AVOD, it seems as though generating revenue from great content just got a lot easier. Sounds great, right? The answer is both yes and no. Yes, because content producers have both a hungry audience and a growing mix of digital retailers with whom to partner to monetize their content. And no, because there are more business models, across more territories, involving more storefronts, requiring more functionality, than ever before. Without the right game plan, and the right expertise, things could go off the rails quickly. But with the right strategy, the content bonanza can produce a monetization windfall for those willing to do their homework, set a smart strategy, and apply science to this emerging opportunity. In his new book “The Brain that Changes Itself,” author Norman Doidge, M.D. describes the work of “brilliant scientists championing the new science of neuroplasticity” in which the human brain is shown to function differently than historical scientific doctrine might suggest. He demonstrates that it can and sometimes does “reorganize” itself, based on sensory perception, experiential and external inputs. If our media ecosystem were a brain, perhaps it could adapt in the same pliable way, for and by itself. Sadly, even with promising work in AI and blockchain, media cannot change itself — at least not yet. It is hardly “automatic” for supply chain participants to adjust to new platforms and business models that have arisen to address the new way we all consume content. Reorganizing how we as an industry address these developments will reward some and leave others behind — unless they adapt and embrace this new consumption and technology paradigm. Poll after poll reminds us that “Millennials still watch a lot of video content, but increasingly, that content is being viewed on subscription streaming video services and on mobile devices.” No surprise, right? Yet what some do find surprising is the complexity of navigating the patchwork of retail relationships and platforms required to monetize that content. Once upon a time, you could license an ad-supported channel or transactional movie package to a handful of MVPDs and reach most pay TV households in the U.S. Today, that model is under increased pressure from an onslaught of skinny bundles, low and no cost vMVPDs, free “channels” from Amazon and others, and movie collections from myriad SVOD platforms. Data suggests that consumers are responding, especially via their mobile devices. It’s not just the providers and models that are changing, however: From VOD streaming to MRSS posting, SDR to HDR, and all forms of ML-enriched metadata – provisioning asset packages for multiple retail models requires a new level of orchestration and logistics. So, you’ve got an ad-supported “channel” to sell? Great, how will you generate enough views to support a rational AVOD ROI? Got a film or TV series that you think has legs? Fantastic, how many digital retailers need to find it, license it, package and sell it, to make the math work? How do you go about creating a plan, and what is the ideal mix of models and partners? Consider the evolution of a film aggregation company that debuted a decade ago as a movie selection nestled within a third-party VOD package. Today, that company offers not only a branded selection of transactional movies across territories, but it also operates a branded channel on Roku, and licenses some films into the Roku Channel. They recently rolled out AVOD on Vudu, PlutoTV, Xumo, and are generating revenue from SVOD here and abroad, including with traditional U.S. cable operators. That same company is now gearing up to launch a DTC channel. But in order to do so, they had to “reorganize” their thinking about how to optimize their value proposition in a rapidly changing marketplace. And they needed some help from forward looking partners. In achieving that vision, there was no simple recipe to follow. They had to take control of their libraries, manage rights, enrich metadata, efficiently transform and process asset packages, market their vision, and look a bit beyond the horizon. It didn’t happen overnight, and we all worked to refine that strategy along the way. Many content producers and owners are faced with similar challenges today. The first step is to reorganize your thinking around what it takes to be successful in this new reality. What works in the U.S. doesn’t necessarily work in LATAM or Canada, much less Europe. Despite its demonstrable successes, SVOD is not the only way to profit from content. And AVOD can be a minefield for the uninitiated. Traditional models of aggregating, selling, managing and supplying content are yielding to newer, smarter methodologies, incorporating machine learning and intuitive technologies that put greater control into the hands of content owners. But all the smart tech in the world cannot make up for a smart strategy and the use of reliable and experienced partners to achieve it. In this new content ecosystem, you need all of the above to thrive. As the service and technology industry that underpins content monetization, innovation remains our strongest advantage to support a dynamic marketplace faced with both challenges and enormous potential. It’s no longer good enough to stay in your lane, tighten costs, and hope for the best. 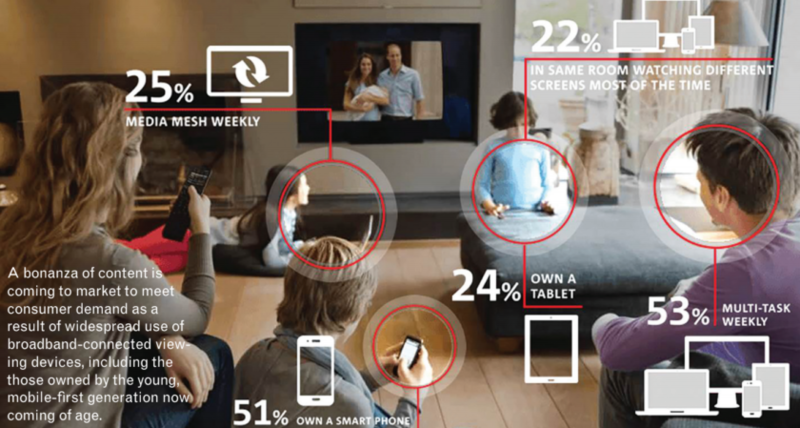 Consumer tech and consumption patterns will continue to change — that’s a given. It takes investment in smart technologies, market insight, and a willingness to see beyond quarterly results. For those willing to acknowledge this reality, reorganize their “brains” and embrace a comprehensive, strategic approach with the right partners, the content bonanza can indeed be bright.